How to build a website quickly using Platform over Custom development? How to build a website quickly using Platform over Custom development? You are here: Home / Blog / Magento / How to build a website quickly using Platform over Custom development? Using a platform over custom development is a cost-effective way to launch your website in quick time. Most of us, face a challenge of reducing time-to-market to ensure our product launches. This challenge has made time the most valuable resource for everyone. To meet the crazy deadlines, we try several ways to speed up the software development. We use optimized ways for delivering the product on time e.g. we add more developers, follow the agile development process etc. We have been using these platforms for our clients for a long time and have launched their ideas or visions in a few weeks. This approach helps them to cut the initial costing and actually test the water in the market. Normally the quick launch of the product is cost-effective and allows you to raise funds from investors or who knows a big company acquire your product. Need to know more about it then take a look at our success stories here. One of the advantages of these platforms is that these platforms are almost free or cost is very nominal. You can start using these as soon as you install it. There is no configuration required, aside from the customization of your theme and adding the desire plug-ins. Most of the things you are looking for coming with the installation. In some scenarios, you do not need to hire web technicians and designers to launch it. For Example, if you want to launch your business website, then you need to buy web hosting using WordPress. If your website is simple and doesn’t need much change in the platform then you can add the website contents. Imagine you need to launch a little complex website like freelancing marketplace. You can do it by hiring a development team. The team must install the freelancing plugin and you are ready with your website. They may install a different theme so that the website looks clean and professional. We had launched a freelancing website (based on WordPress) in three days for our client as the minimum viable product. Using this demo, our client had shown a running version of the website to investors and got the funding. Now we have started working on the details requirements and hope to launch it soon. With the right infrastructure, services, and resources, these platforms are highly scalable. These platforms can serve tens of thousands of logged-in users at a time and deliver hundreds of millions of monthly page views. So you need not worry if your website should be able to handle the user traffic load. One of the clients has a social networking website for bikers based on a stable platform SocialEngine. The traffic on the website is huge and has been handled well using the AWS hosting. If we would develop the website from scratch then it would have cost him multiple times to have the same the scalability. So using SocialEngine, Client not only saves the cost but also able to launch a website which can handle loads of thousands of users. Responsive Web design is the approach that suggests that design and development should respond to the user’s behavior and environment based on screen size, platform, and orientation. Most of these platforms are built on responsive web design i.e. the website looks good on every device. Google is penalizing sites that aren’t mobile-friendly by ranking them lower on their result pages. With these platforms, you don’t have to overhaul your entire site to make it accessible on tablets and smartphones, since most themes are automatically responsive. These platforms integrate with everything (near enough). If there’s a service you’d like to integrate with your website, chances are there will be a plugin, or at the least an easy to use API. We created a corporate website for one of the clients using WordPress in quick time. We found lots of plugins in WordPress which met the requirements of our client e.g. They want a newsletter feature to send out to their subscribers so we used a MailChimp plugin for it. The integration was done in less than an hour. The client also wanted integration with the Salesforce’s marketing automation tool pardot and as we expected there was already the plugin for it. So you can imagine how powerful a platform can be in terms of adding third-party services to your website. Out of the box, these platforms are SEO friendly. Popular search engines, like Google and Bing, tend to rank websites that use these platform higher than those that don’t. This is because the platform framework makes it easy for the search engines’ spiders to crawl. These platforms are flexible enough to accommodate all needs through its themes and plugins, whether you’re using the platform for a small business website, personal blog, social networking website, an eCommerce website and beyond, you can virtually build any kind of website using the platform. Given its widespread appeal, there are a large number of plugins available to add new features to these platforms. An unbelievably large number of themes are available for each of these platforms. These themes are editable, and this approach allows you to modify them to your content. With the popularity of these platforms come the interest of would-be hackers. Another reason why these platforms are so beloved is the security measures the developers take to preserve the trust of its users. These platforms constantly update it, along with the plug-ins that integrate with it. Of course, users should use caution and only download plugins from trusted sources. 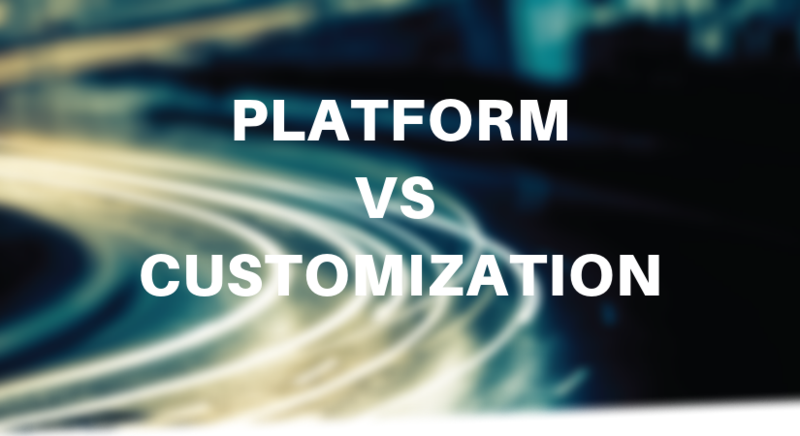 You can make your platform look any way you want with a customized theme and plugins. There are both free and paid plugins/themes available so you can choose whichever suits your requirements for the website. If you need a specific solution then you can hire one of the development teams from thousands of third-party vendors. These platforms keep improving as the years go by. Whether they are adding new features, developers are creating new plugins, or coders have programmed new features to customize your site, the platforms keep evolving for the better. Usually, it costs around $5,000 to $50,000 to hire a team who develop a custom website for your ideas. Add the yearly maintenance fees to it and you shall spend most of your budget in building the entire website. But if you choose a standard platform then it costs around $500 – $2000 (sometimes even less than $100) to set up and launch a website. So you can save a lot of money and spend it wisely on your marketing and operations on your website. We have been building websites and mobile apps for the last 10+ years using platforms. We found product development is more efficient using platforms than building it from scratch. If you are looking for building your own social network then we recommend using SocialEngine. The other options to networking website like Buddypress, phpfox or oxwall. But we recommend Socialengine due to a stability, plethora of third-party plugins and themes. If you are looking for building your own eCommerce store then we recommend using Magento or Woocommerce. You can have an online store ready in a few days after spending nominal cost(sometimes less than $100). If you are thinking of launching business websites, freelancing marketplace and beyond then you can use WordPress for it. Want to launch your product on time in the market? Feel free to contact us and we can guide you.